Do you happen to have any quarters dated 1932 to 1964? I'll give you $2 for em. I'm not really in the coin buying business but those quarters are actually worth over $7 so I figure I can buy em for $2 and make a mint. 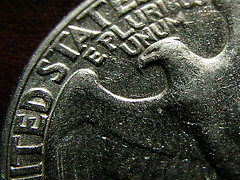 Quarters minted before 1964 used silver. Lately silver prices have climbed a lot. The actual silver metal in the coins is worth considerably more than the face values of the coins. This is also true for older dimes and some other less common coins as well. The Coinflation website has a nice table showing the melt value of various coins versus their face value. Currently as I write this, dimes from 1946 to 1964 are worth about $2.86 and quarters from 1932 to 1964 are worth $7.17. The values will fluctuate up and down based on the current market value of silver. This is hardly a get rich quick scheme and I don't want to lead you on thinking you're likely to be sitting on a pile of valuable coins. Spare change from 1964 or earlier is not really that common. For one, many people already figured out they are worth much more in silver so they've been hunting for them and pulling them out of circulation. Secondly, 1964 is actually a long time ago. 47 years is a long time for a coin to float around and not be removed from circulation. On the other hand you could quite easily have some older dimes or quarters somewhere. Many people, if not every single American, tends to accumulate coins in a jar or coffee can somewhere in their house. If you dig into that pile of coins you may find a rare older silver coin. Maybe you don't have many coins or arent lucky enough to have an old one. You might know an older relative with a pile of coins they've had since 1978 or whenever that could be half full of old coins. Hold on, I'm not suggestion you steal valuable coins from your elderly relatives, please don't do that. But you could give your relatives a heads up to let them know that some of their old coins could be worth a lot of money for the silver value alone.